A displaced South Sudanese woman prepares a meal in a camp for internally displaced people in the UNMISS compound in Tomping, Juba, South Sudan, July 12, 2016. A fragile cease-fire called by rival leaders appeared to hold Tuesday in South Sudan's capital, Juba, after four days of artillery and small-arms fire that left hundreds dead and displaced thousands of others. The truce, called by President Salva Kiir and his longtime opponent, First Vice President Riek Machar, was welcomed by combat weary residents and by foreign governments worried that Africa's newest country risks slipping back into full-blown civil war. In Washington, the U.S. State Department voiced caution, with a spokesman noting reports of sporadic gunfire in parts of Juba despite the relative calm. Spokesman John Kirby told reporters he didn't foresee the evacuation of the U.S. ambassador, despite what he described as the "ordered departure" of non-emergency personnel from the U.S. facility. The Norwegian Refugee Council (NRC) has been providing relief and support for civilians who have fled fighting in Juba, but the group has, like other aid agencies, had to suspend its efforts because of the violence. Fighting along ethnic lines erupted Thursday between troops loyal to the president and those aligned with Machar. It surged for three more days, leaving a path of wreckage and human suffering not seen since the two-year civil war ended in 2015. On Juba's streets Tuesday, visitors looking for food in the city's central market were met by a rude sight: looted stores and sharply increased prices for suddenly scarce goods. Traders in the Jebel market had arrived early Tuesday to find their stalls and shelves picked clean. Aziz Francis said his shop was worth about $33,000. Everything was stolen during the fighting. He blamed soldiers who were assigned to protect the market. 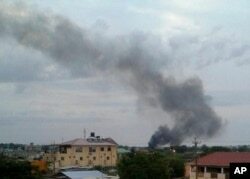 FILE - Black smoke rises above Juba, South Sudan, July 10, 2016. Explosions and heavy weapons gunfire shook the city as clashes between government and opposition forces continued. Francis said the shop is his only source of income. He was worried about how he would support his wife and three children and pay school fees. Another trader, speaking on condition of anonymity, spent the morning removing merchandise from his shop, which he said he was shutting down. With much of the merchandise gone, prices in the market have shot up. The cost of a kilogram of meat has jumped from $20 to $26. A sack of rice that once sold for $300 now costs $500. The government urged Juba residents to resume their normal activities, and soldiers were patrolling the streets. But many damaged and looted shops remained closed late Tuesday. It appeared some would not reopen at all.